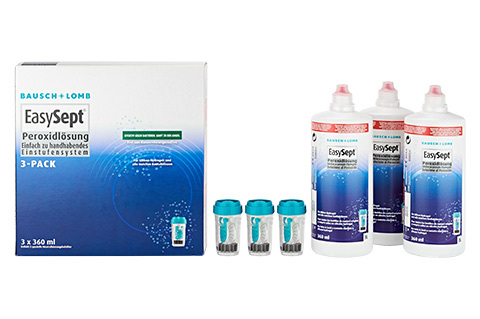 The EasySept care product is a reliable and established one-step peroxide system for the disinfection and neutralising of all soft contact lenses. The platinum catalyst removes the protein deposits within 6 hours and, in combination with the EasySept solution, ensures an optimal sense of well-being. You will find yourself best-equipped with the 3x360ml package. Five step advice for application: First, wash your hands thoroughly and place the contact lenses in the appropriate section of the container. Fill the container with EasySept care solution up to the level marked. Then, you need only wait for 6 hours until the protein deposits have dissolved. Finally, shake the container with the contact lenses inside and open it up, to remove your freshly cleaned contact lenses.